Back in April I was lucky enough to experience life as an Oyster wildlife volunteer in Thailand. For two days I enjoyed working next to some of my favourite animals, whilst also enjoying the beauty and warmth (great when you have just lived through a freezing British winter!) of this lush country. The drive from Bangkok out to the wildlife sanctuary is one full of contrasts: starting in the bustling and modern city and gradually heading into an “older” part of the country, one which still gives you glimpses into the uniqueness of Thai culture. Driving through the lush green fields and the thick vegetation of the forests, I was struck by how perfect a location it was to create a haven for mistreated wildlife. The first thing that struck me on entering the sanctuary was the noise. I had thought that the birds outside my bedroom window at home were loud! There was so much chattering going on between the animals- monkeys, gibbons, macaques, lorises and civets- not to mention the birds. It was such a vibrant sound, so wild, and I instantly felt at home. The tour of the sanctuary, home to over 400 animals, certainly took up a substantial part of my day. 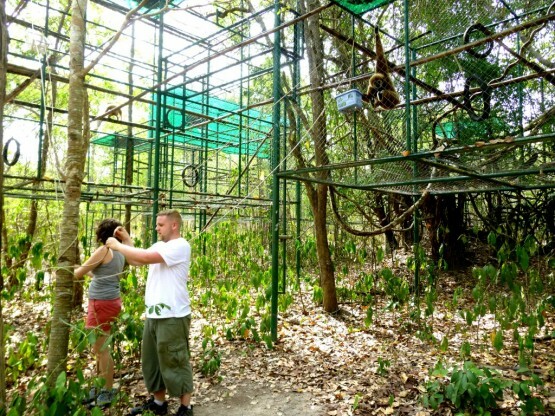 We started the tour in the depths of the forest, where primates live in large enclosures up in the trees. Seeing a mother swinging around majestically whilst her tiny baby hung on for dear life was great to see- in a space to live in that is much larger than what they had formerly been subjected to. The tour then took me through to the Malayan Sun Bears, who were both smaller than I had expected but also lovelier. I loved their large enclosures with pools to swim in and plenty of trees and grass to be playing in. Next came the birds, the deer, the nocturnal animals, and then finally the elephants. My introduction to the elephants was to wander with them on their afternoon stroll where they are under careful supervision from the mahouts and the volunteers. It was a real treat to be walking through the rainforest with an elephant at my side. My tour finally took me up to new enclosures being built on the sanctuary grounds. The number of animals that needs rescuing is constantly growing, and as such the sanctuary needs to be growing too. The volunteers really free up the full time members of staff, allowing them to build enclosures and rescue mistreated animals. Without the volunteers to help with the feeding, watering, care, food preparation, cleaning and enrichments, this sanctuary would cease to exist. The working day came to a close late afternoon, when volunteers grouped together for a beer and a relax together. There was a real sense of achievement from the physical exertions of the day. The following day was my turn to muck in and get to grips with being a wildlife volunteer in Thailand. I was excited! It started with doing the rounds of the primates enclosures, emptying their old water containers, cleaning them and topping them up again. Then came the food prep (lots of yummy fruit and veg!) and the feeding run. All of this takes place with the backdrop of the animals, and it was a real treat to just look up and see the monkeys chasing each other, or simply intrigued in what I was up to. My next task included cleaning out some enclosures for the nocturnal animals and then cleaning out the bear’s ponds. There are many tasks which change on a daily basis, and so you are never finding yourself doing lots of the same thing. It was great to be close to the bears, doing some physical work and knowing that what I was doing was, in some small way, helping towards the welfare of my favourite animal. Have a look at our website for more information about volunteering with wildlife in Thailand.